Black and white photograph of Red Cross fundraising carnival in Wangaratta​ with 'ELDORADO Will Be There' banner and mine sluicing nozzle rigged on a pair of sulky wheels as a field gun. 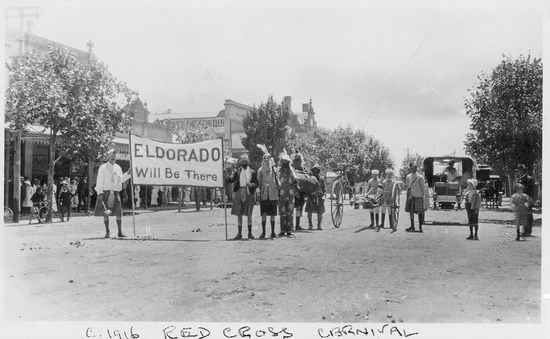 El Dorado Red Cross began in 1914, and was one of the earliest to be established in Australia. "C.1916 RED CROSS CARNIVAL" at bottom. 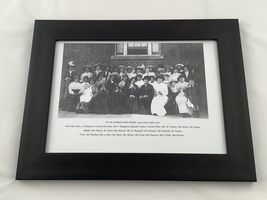 Framed black and white copy of group photograph of members of the El Dorado Red Cross, 1915. 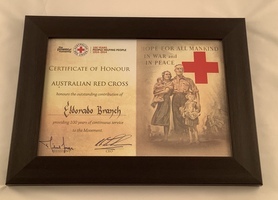 Framed certificate with text, image of man, woman and children and Red Cross logo. Account book with light blue cover and dark blue text, and handwritten notes inside. Donated to museum as part of the El Dorado Red Cross 100th anniversary. 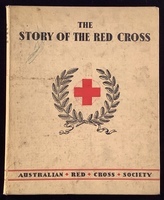 A4 book with white front cover with black text and Red Cross Logo. 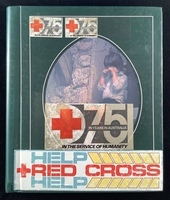 Green covered photo album with Red Cross logo, text and images on front cover and photographic images of El Dorado Red Cross inside. 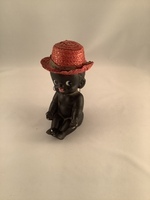 Donated to museum as part of 100th anniversary of El Dorado Red Cross. Foolscap sized covered book with green and blue pattern and handwritten minutes of the meetings of El Dorado Red Cross inside. A4 sized magazine with yellow front cover with red text and black and white images. 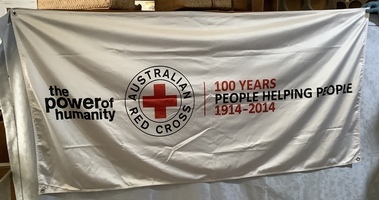 Large white banner with large Australian Red Cross logo and text. Rosella sauce bottle covered with crocheted bottle cover. 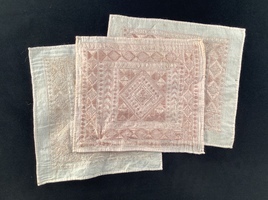 Woven table centre piece with three squares joined by overlapping in an asymmetrical order. 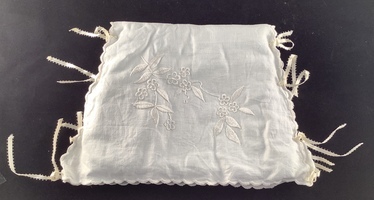 White coloured, bottle cover with embroidered pattern in centre and around edges. 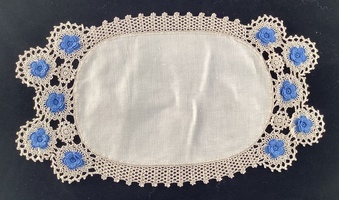 Oval shaped, cream doily with blue embroidered flowers at either end and an embroidered border. 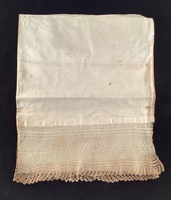 A cream antimacassar lined with crepe. 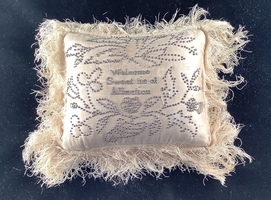 White tea cosy with floral pattern embroidery on front, cream ties on side and blue lining. 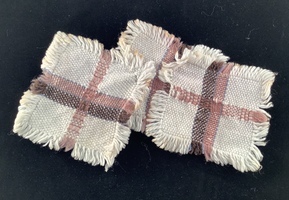 Cream table runner with detailed pattern at each end and plain backing. 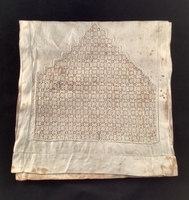 Table centre cloth made of three embroidered squares joined together in an overlapping asymmetrical pattern. Plastic doll in handmade pale rainbow coloured knitted dress, white petticoat with lace trim, cream knitted singlet and underpants. Child’s toy owned by Lian Phillips of El Dorado, Victoria. Dressed by her grandmother in handmade clothes. 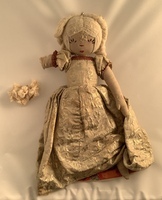 A reversible cloth doll showing two faces, four arms and hands, two torsos - one doll on the bottom and one on the top, stuffed body. Like the two sides of Cinderella - working clothes/ornate dress. Owned by Mary West of El Dorado. Send an email to El Dorado Museum Association Inc.